Distillation is one of the most ubiquitous methods for the separation of chemicals. The simplest distillation column has three streams: feed, distillate, and bottom (or residue). Feed is the mixture that is treated using the distillation column in order to separate its constituents. Feed can be a binary or a multicomponent mixture of chemicals. Distillate and bottom are subject to product purity specifications. 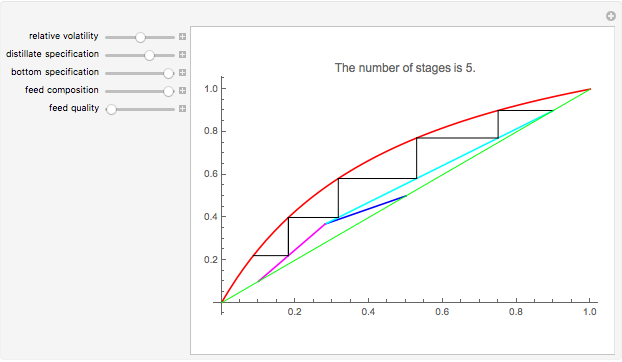 This Demonstration presents the McCabe and Thiele graphical method, which is applicable to binary mixtures. First, the rectifying and stripping operating lines are plotted using a reflux ratio equal to 1.5 times the minimum reflux ratio. These lines are derived by writing global and partial material balances around different sections of the column. The feed line is also plotted. If the construction is correct, these three lines must intersect at the same point. For the separation to be feasible, you must choose parameters (feed quality, bottom, feed and distillate compositions and relative volatility) that cause the intersection point to fall below the equilibrium curve. The equilibrium curve is plotted assuming constant relative volatility. A large constant relative volatility indicates that the separation is easy, while values of this parameter close to 1 will result in a large number of theoretical plates. The stages are stepped off using the equilibrium curve and the two operating lines in order to determine the number of equilibrium stages or the number of theoretical column plates. The horizontal and vertical axes are the liquid and vapor mole fractions. The curve is the equilibrium curve. In fact, every liquid (with mole fraction ) is in equilibrium with its vapor (with mole fraction ). If relative volatility is constant, there is a simple relation between and . 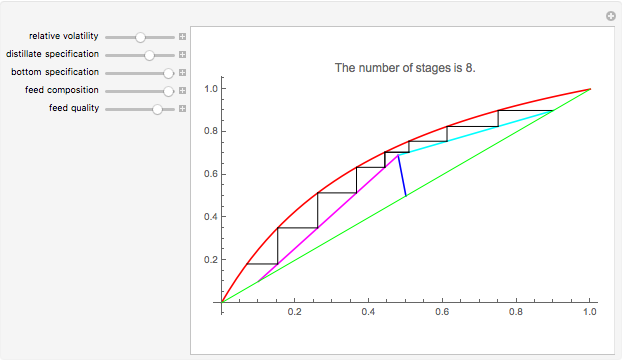 The line segments allow a visualization of the steps, which are equilibrium stages. One limitation of this approach is that it will not work when the feed is saturated "liquid" (feed quality ) because the slope of the feed line becomes infinity. The Demonstration displays the number of stages, which is the sum of the plates in the rectifying and stripping sections. The optimum feed plate is the stage where the operating lines intersect. (1) H. Binous, "Equilibrium Staged Separations using Matlab® and Mathematica®," Chemical Engineering Education, 42(2), 2008 pp. 69-73. Housam Binous "McCabe & Thiele Graphical Method"